Castor oil is derived from the castor bean and has been used for everything from lubricants to dyes to laxatives. Alternative uses have involved the use of castor oil to help pregnant women induce labor, although physicians warn against this practice because it may lead to undue fetal distress. These days, castor oil is most often recommended as a quick-acting laxative prior to surgery. castor oil itself is tasteless and carries no pungent scent, the human gag reflex appears to keep people from swallowing it easily; it sometimes can take several attempts to swallow castor oil and not regurgitate it. However, there are some simple steps to taking castor oil so you can derive all of its benefits—without gagging. Place the castor oil in the refrigerator overnight. The objective is for the oil to be well chilled. After letting the castor oil sit overnight, pour a glass of lukewarm water and add a bit of salt to it. This will act as a mouthwash you can use after you have downed the dose of castor oil. Stand next to the bathroom or kitchen sink. Remember that you want to be prepared to wash out your mouth with the glass of saltwater and then spit it out. Pour the dose of castor oil you are going to take into a shot glass or other small drinking receptacle. You can also drink it straight from the measuring cup. Close your nostrils by gently pinching your nose shut with your fingers. Drink the castor oil dose in one swig. Do not savor it; do not swish it around your mouth; and do not take a lot of time letting it run down your throat. Pick up the glass with your lukewarm water and salt solution and take some into your mouth. Let go of your nostrils. Swish the saltwater around in your mouth. Gargle with it and then spit it out into the sink. Repeat the saltwater swishing and gargling if you still have a bit of an unpleasant oily aftertaste in your mouth. Chances are, though, one time will be enough. You can also mix orange juice with your castor oil to mask the oily sensation sufficiently to overcome a gag reflex. The lukewarm water and salt solution also makes a great home remedy for halitosis. Alternative health experts suggest that this is a much healthier way of killing plaque and odor-causing bacteria in your mouth than any commercial mouthwash. Your dosage of castor oil is determined by your weight and age or the condition you are seeking to treat. Check the bottle of castor oil for a dosage chart. If you have previously taken a relatively small dose and it proved ineffective, increase the dose by 25 percent and give it some time to work before considering another dosage increase. Do not take castor oil for more than a week. When used as a laxative, your body can become accustomed to having stimulation to eliminate the contents of the bowel and may interfere with normal functioning. Visit the AnnieAppleSeedProject.org website to learn about various uses for castor oil. 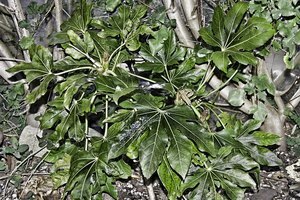 Learn about the castor oil plant at the Botancial.com website. Warnings about the castor bean plant at the ANSCI.Cornell.Edu website sponsored by Cornell University.